Rampage coats are for women who know what they want. 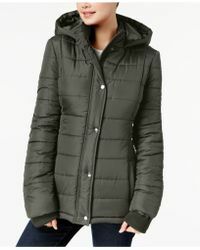 The brand's puffer designs are perfect for keeping out the chill while still leaving you looking good. In a range of bright colours, the faux fur-trimmed hood and waist belt are just an added bonus to an already brilliant style. Pair them with everything from your favourite jeans to printed leggings and you'll look better than ever.